In my previous post, Training Camp I discussed ways to prepare yourself to gamify instruction in your classes particularly for those of you who are not gamers. Continuing with my football metaphor, I want to share with you how I designed my playbook for my Physics game. Though it may seem daunting, you will find that designing your game is incredibly similar to how you would design a unit in one of your classes, as the mechanics that you might use in a game align well with the pedagogical practices that we use everyday in our classroom. Having said that, with gamification, I found that students experience heightened anticipation, emotional engagement, and ultimately greater success due to the interweaving of game mechanics and fictional elements coupled with a disconnect from the pressure associated with grades. The screenshot above from Angry Birds does a great job of illustrating this. Angry Birds is divided into worlds. The first world of Angry Birds is called "Poached Eggs" which establishes the fictional elements of the game. Each world is divided into levels that increase in complexity and difficulty as you move through the world. The levels remain locked until you pass the level below. Locking levels is a game mechanic that creates anticipation. What will I find in Level 2?!? There are multiple ways to pass each level with varying degrees of success equated to points and stars. You also have the opportunity to redo each level if you are not satisfied with your feedback. 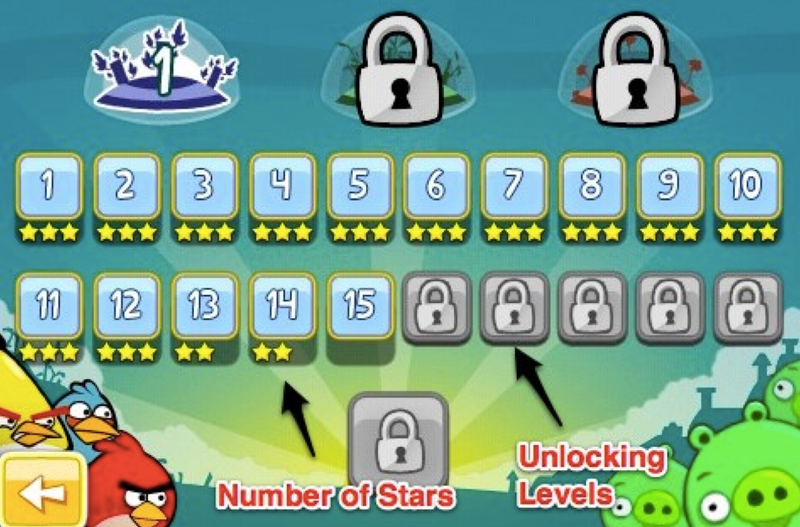 For a more detailed description, check out the Angry Birds Wiki and explore one of the themes (levels). See if you can identify the game mechanics used to create the emotional experience that you have when playing Angry Birds. Now compare the description above to a unit that you teach in your class. What would you need to do to heighten a student's anticipation? How could you reduce their anxiety and transfer their focus from grades to the learning? Does your content become more complex and difficult as you progress through the unit? How frequently do you provide feedback to your students? What opportunities do they have to act on your feedback? Keeping these questions in mind, let's get started on designing the shell for your game. As with any unit that you design, you must have your learning objectives in place before you create your assessments. It is crucial that these are clearly articulated so that you can integrate them into the game play. Students should not be able to be successful in your game without demonstrating mastery of these objectives. When choosing your learning objectives, you should focus on content that can easily be divided into smaller chunks and levels of difficulty or complexity. One of the most appealing aspects of games is player control. This translates into empowering students to be in control of their learning. Your game should give students voice and choice over their game play, and allow for self-pacing. Select content and skills that will allow you to be as far away from the driver's seat as possible. My advice for those of you who are new to gamification is to start with something small and manageable until you get the hang of it. Keep in mind that games are not perfect for every situation. Gamification works really well with Math and Physics units. For other disciplines, you need to think carefully and creatively about how you will go about structuring your game. For my physics unit, I had the topics of work, power, energy, and momentum to cover. When I decided to gamify this unit, I focused my first “world” on work alone. This narrowed down the list of learning objectives considerably making it easier to differentiate and assign levels. demonstration, practice, and test mode (this is similar to the model that I used). Level 1: The collaborative, self-directed learning level. I used online resources (Physics Classroom, and G-docs) to guide their learning. The learning was self-paced, and this blended learning approach allowed my stronger students to forge ahead to more challenging tasks, while freeing me up to help the weaker students one-on-one or in mini workshops. Level 2: The challenge level (read test). I made it a requirement that students had to get a minimum of an 85% to receive their badge. However, they were allowed to retake it if they didn’t accomplish it the first time through. Level 3: The project level. I designed this level to force them to use higher order thinking skills (problem solving, creativity, critical thinking etc.) to accomplish the task. Within the level, I built in different levels of difficulty to keep the stronger students in their “flow”. Flow is a very important concept in games. Keep in mind that you can lock levels and keep your students in the dark. It increases their excitement and anticipation while at the same time allows you to call audibles and change it up in the middle of game play. Win-win! CAUTION: Be cognizant of the amount of content you put in each level and the amount of time that you allow for it. If students are stuck in a level for too long, they will move into the zone of boredom and lose interest. Timing is key. One solution to this is to add sublevels (see example). Change things up after every sublevel, or have mini-activities in place for some hands-on experiences. I would recommend adding these at the end when you go back to revise your game. Another game structure you should check out is Michael Matera's Realm of Nobles that he created for his 6th grade world History course. He does an awesome job at illustrating how you can gamify content in language-based disciplines. ensure that each level is challenging enough to maintain their curve of interest (flow) for all students (differentiation). In my next post I will discuss assessment/reward/feedback strategies. If you missed my previous posts on gamification, you can find them all at this link.